With a one-of-a-kind kitchen design in mind, Mr and Mrs Williams worked closely with Kitchen Design Centre to create a stunning masterpiece they will enjoy for years to come. With a plan to extend and remodel their whole house, it was only fair the Williams’s treated themselves to a new kitchen during the process.“Our kitchen was a major problem area before, along with the living room and bedroom, so we thought it was about time we took measures to fix it and create our dream kitchen,” says Mrs Williams. 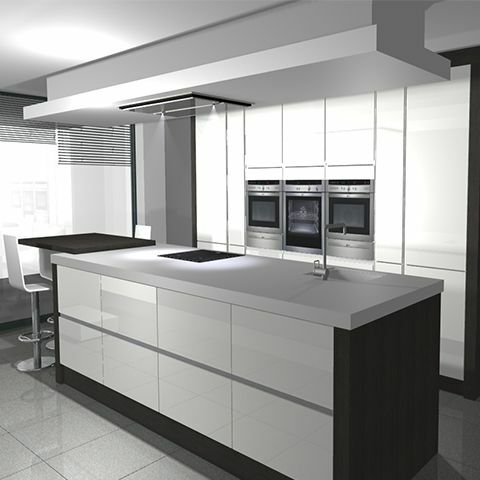 Designing it was easy, with their creative imaginations mixed together with the expertise and skill of Kitchen Design Centre. The Williams already had a good idea of what they wanted when it came to their kitchen. “We knew what we wanted but were open to ideas, which is one of the reasons we turned to Kitchen Design Centre,” explains Mrs Williams. 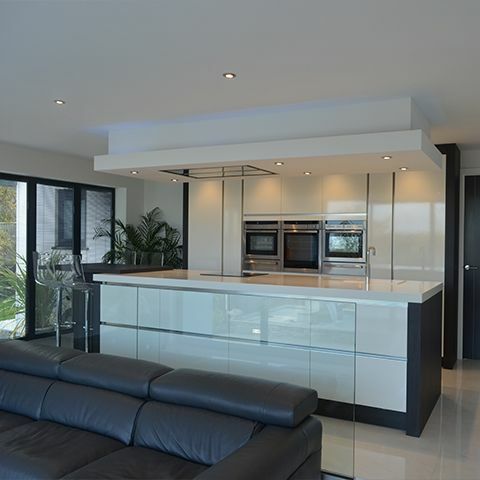 The couple knew that the team at Kitchen Design Centre produced great kitchens that were of high quality, which was of huge importance to the Williams’s. The design chosen by the couple was modern, high spec, and minimal – a popular request from many of our clients. They chose design ideas from displays in the Manchester showroom, but wanted to add their own stamp on it to recreate and exaggerate its style and feel in their own way. One thing that made this kitchen stand out from the crowd was the fact the whole kitchen was raised up – built upon a raised floor, creating a stunning overall look. What’s more, the whole kitchen sat behind a glass screen with a view over a large fish pool and beyond to the rolling hills. Having chosen a minimal design, the kitchen featured handle less cupboards, German furnishings and simple straight lines – both horizontal and vertical. Corian worktops were incorporated into the design along with a Terra Oak raised table and bar and a gorgeous central island. All appliances fitted were from top brand NEFF and of course all sat at the perfect height tailored to the Williams requirements. The NEFF appliances included a compact oven, warming drawer, fridge freezer and dishwasher. 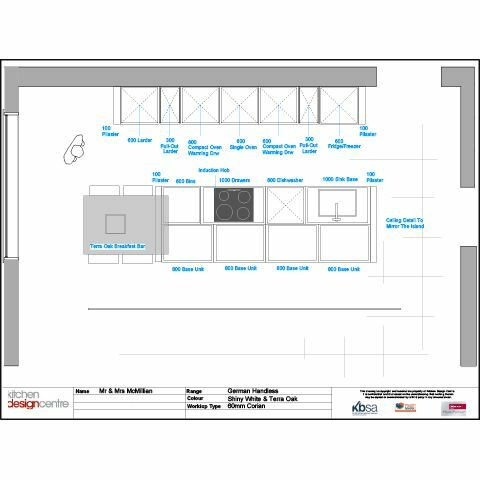 Kitchen Design Centre were there to support the Williams’s throughout the whole design process, from building work, right through to installation. 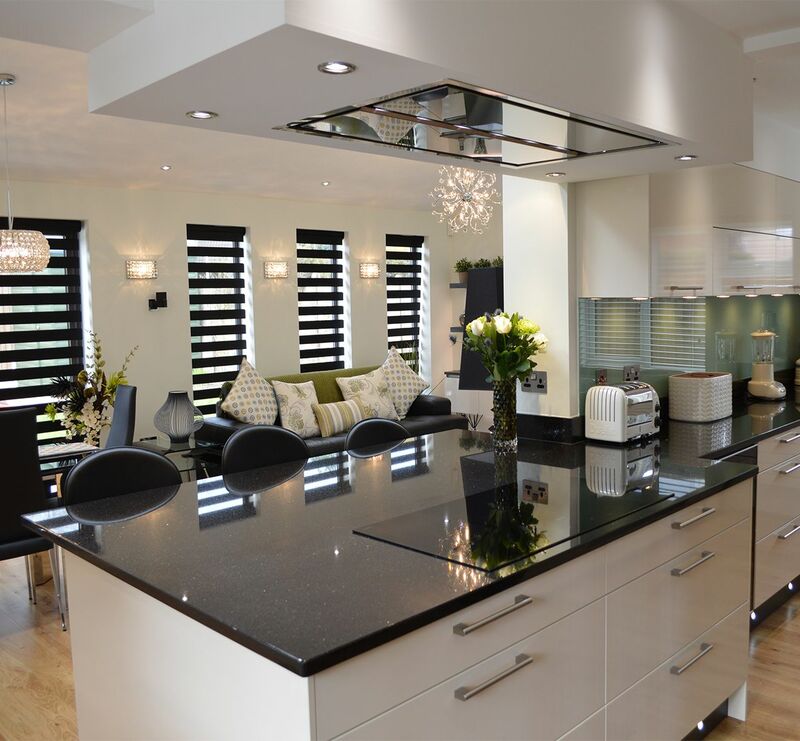 “We’d definitely recommend Kitchen Design Centre to anyone looking for a new kitchen. They were friendly, professional and very competent – and the process was absolutely stress free too!” says Mrs Williams. "We’re very pleased, our new kitchen is simply stunning"
"The whole kitchen looks remarkable, like a stage on its raised platform. The couple’s initial vision was fantastic and it was great to work together with them to develop a truly unique layout. Even though the materials we used – such as terra oak and high gloss finishes are very popular, this kitchen really stands out because of the of the architecture and the unique setting."